The first thing that came to mind when I read this paragraph was the digital dualism debate. One could, for instance, substitute the human-technology pair above with the online-offline pair and retain the sense of the paragraph. Once mutuality is established, the next, more interesting move is to explore the different forms this mutual relationship takes. 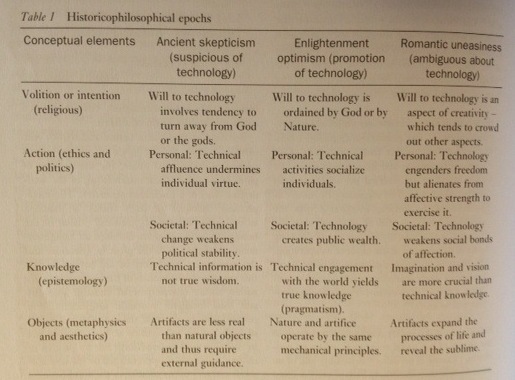 As far as the human-technology relationship is concerned, the three ways of being-with technology that Mitcham outlines are ancient skepticism, Renaissance/Enlightenment optimism, and Romantic uneasiness. I suspect you might already have a pretty good idea of how Mitcham fills out those categories. (The chart below gives a decent summary.) Perhaps this being-with model could also serve to illuminate the online-offline relationship. Might it be useful, in similar fashion, to outline the forms the online-offline relationship takes? One other thought: It seems to me that what I’ve been describing as a “Borg Complex” could be understood as a being-with relationship of the sort that Mitcham describes. The “resistance is futile,” adapt or die rhetoric is what led me to identify this rhetoric as a Borg Complex, but the symptoms I’ve compiled also suggest something more expansive than this techno-fatalist attitude. They encompass an entire posture toward the human-technology relationship — one that has certain affinities with Mitcham’s Renaissance/Enlightenment optimism, but departs from it as well. So, looking at this chart, I’m wondering if it might not be updated with a category that accounts for the Borg Complex and then also one that accounts for what Leo Marx has called postmodern pessimism. I’ll leave these considerations with you this afternoon. More thoughts along these lines may be forthcoming in the not-too-distant future. i thought the article was not well expressed and there was too many ideas.